Summer is synonymous with beach, sea, sun and comfort! We dream a lot about spending time at the beach and lounging on the swimming pool every hot weekend. If you don’t leave near a lake or an ocean, you will plan a holiday or at least a weekend to enjoy water before summer ends. Nothing seems more relaxing than getting to a beach with white sand , we take our towel out of the bag and lay comfortably on a long chair. And our comfort is completed by the objects we need, from the telephone and the water bottle. No matter you get to Mexico, Greece, or to a pool this summer, we know that for us, the girls, is not only about we have in our bag, but much more than that. It’s high time we talked about what type of bag we are taking with us at the beach during the day, or at the evening walk. This is why you need a beach bag which should not be as interesting as your swimming suit only, but also spacious for all those little things you cannot deprive of when you’re on the beach. On the beach, on the sand, at the seaside everything has a connection to the water now, because we have activated ourselves as soon as sun came out and wore the first pair of sandals. From the stunning vibrant colours , to endless fringes or adorable tassels attached by little glass mirrors, beach sacks come in all forms, sizes and materials we like most. 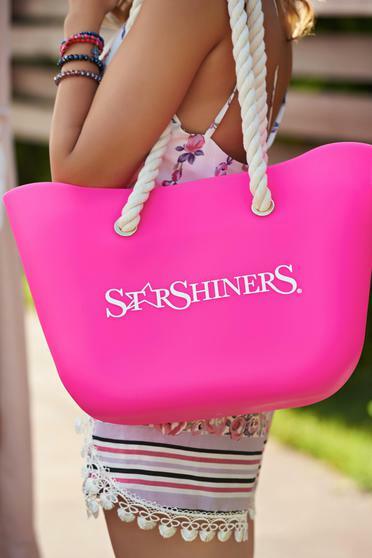 Discover which one suits the most with your destination this summer, on StarShiners.com. Have a lot of luck at shopping and day-dreaming!